What Are the Economics of an Actuator? Follow us @CITOrg or @dihrie or this blog for current information on the new Smart City Actuator. Running a successful Actuator, accelerator, incubator or similar early stage investment program requires finding the sweet spot where three sets of economics overlap: those of the early stage entrepreneurial ventures, the investors that support the ecosystem, and the actuator itself. The economics for early stage entrepreneurial ventures is conceptually fairly straightforward: when does the cash run out, and can I raise enough money before then to keep the company going? In the vernacular, this is the “runway”…how much runway do I have left. And the job of the early-stage CEO is almost always heavily tilted towards fundraising. Two things make this more palatable. First, a successful accelerator will already include a number of investors in the ecosystem, and the program itself will help the entrepreneur better understand who to approach for funding, how and why. Second (the economic carrot in this plot) is the proverbial “exit.” At some point a successful early stage company starts selling enough product that somebody thinks the company has a great future, or the people are worth collaborating with, or the product is a good strategic fit. At that point they may buy the company, do an “acqui-hire,” or put in enough money that they bring in some new people to help run the company. Oh yes, and occasionally things can even appear so successful that they start selling stock to the public: the IPO. Investor economics are also similarly straightforward: investors are always looking for good (or great) returns based on the amount of risk they take. Early stage investors make very risky investments, and so expect very good returns for their money. How risky? Well, the attached chart shows that roughly half of all venture investments lose money while only 5% generate about 1/3 of the total returns; not necessarily where people want to put the bulk of their retirement funds, for example. On the West Coast this has in part led to the great Unicorn hunt, with big money trying to find or create the 1% of that 5% that turns into something like Facebook or the Snap IPO. But it does take big money; if 0.05% of your investments turn into unicorns, $1M investment per attempt takes $2B of investment capital. Things are a little more conservative on the East Coast, and the above chart also shows that half the returns come from investments that yield 2X to 5X the invested capital. And early seed round investments are more like $50K or $100K instead of $1M, meaning that this scales to be a feasible investment strategy for people with high risk tolerance but not quite as much investable capital as Silicon Valley. For individual investors in this category finding a stream of suitable investments and assessing the risk of each one is a daunting challenge. However the Actuator plays an important role here as well, since a significant part of Actuator activity revolves around creating and evaluating a flow of interesting companies, and reducing the risk of those companies surviving and reaching market. This intermediary role for an accelerator in both reducing risk and matching investors and entrepreneurs is one of the characteristics that can make them so effective. What about the Actuator economics? To understand that, these entities are best viewed as startup ventures themselves. The ones we have worked with around the country generally have operating costs in the range of $1M – $5M per year, accounting for salaries, facility and other associated operational costs. Where does that money come from? For many it comes from grants, or community or University funding, legislative appropriations or sponsorships, and these sources are critical for establishing and maintaining a program in the early stages. But is there at least a conceptual model that would minimize or eliminate the need for these external funding sources over time? Yes, and it is very analogous to a startup gaining enough product traction to be self-sustaining on the basis of revenue generated from product sales. 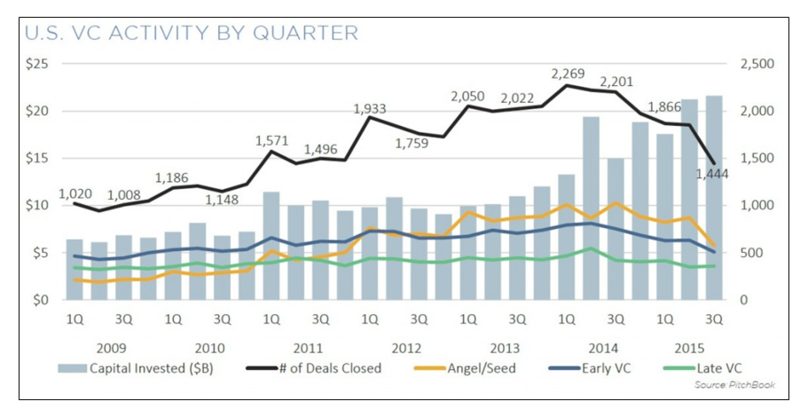 The “product” that accelerators “sell” is investment opportunity in early stage ventures. The quality of that product is directly tied to the quality of the incoming ventures as well as the ability of the accelerator to reduce the risk of those investments through mentoring and interaction with a robust ecosystem. One self-sustaining economic model uses equity investment returns of the accelerator to pay for operating costs, as shown in the figure. It takes 4-7 years or more to realize the value of these investments; the model assumes 5 years. It also assumes $2M/yr operating costs, a dozen investments of $50K per year ($600K total), and a distribution of outcomes consistent with those shown above. So after 5 years, 1/3 (four) of these companies are likely to have failed, we assume four generate 2X ($100K) returns, three generate 5X ($250K) returns, and one generates a 40X ($2M) return. Note that if your initial $50K investment was in exchange for 8% equity and no dilution occurs in between, the company value would need to be $25M for your piece to be worth $2M. As the economic model chart shows, under these somewhat optimistic assumptions (and assuming you can repeat this success year after year) the model can become self-sustaining. While this is a challenging model, it is also helped by the fact that there are a number of secondary benefits that entice external groups to help defray some of the costs. For later stage investment groups this private source of vetted deal flow is attractive. For Universities the ties to entrepreneurship curricula make it a reasonable extension of those efforts. Opportunities for economic growth often entice legislatures, and strategic Corporate partners may see sponsorship an an inexpensive way to find strategically relevant innovative technologies. Creating and sustaining a successful accelerator-type program requires the ability to thread the needle in a way that meets the economic imperatives of three major stakeholder groups: the entrepreneurs, the investors, and the accelerator itself. No wonder that many of these programs do not survive when the initial funding runs out. CIT has been fortunate to have both a successful investment experience with early stage ventures over many years, and much better than average outcomes in running accelerator programs directly. This proven success plus great partners, good timing, and a great environment for building business ecosystems is what will help ensure the success of our new Smart City Works Actuator. Next (Thursday 3/9): Will the Smart Cities Actuator Make Me a Gazillionaire? Since the beginning of 2016, it seems like the worst of times. We have seen a correction in the stock market as the Chinese economic bubble has popped, taking the global oil markets with it, and bringing back the all-too-recent memories of the Internet bubble of 2000 and the financial bubble of 2008 (watch out, 2024!). The misery has spread to the Tech sector. The unicorn, unofficial mascot of Silicon Valley, which had gone from being a rare beast in 2014 to a veritable population explosion in 2015, is once again on the verge of extinction. Yet the economic talking heads tell us this is normal, that the U.S. economy is doing well and is reasonably insulated from both the Chinese economy and the negative oil shock. That corrections are a necessary part of the market, to restore balance after a period of irrational exuberance. So, what the heck is going on with Tech? Here is what I learned. First, tech innovation does not occur in isolation; it is the result of effective regional innovation ecosystems that include customers, entrepreneurs, funding sources, a high concentration of expertise and ideas, and enough of a support infrastructure to help the entrepreneurs through the early pitfalls. Each of the four accelerator programs above has done an outstanding job of helping build and then leverage their local ecosystem as an integral part of what makes each region grow. 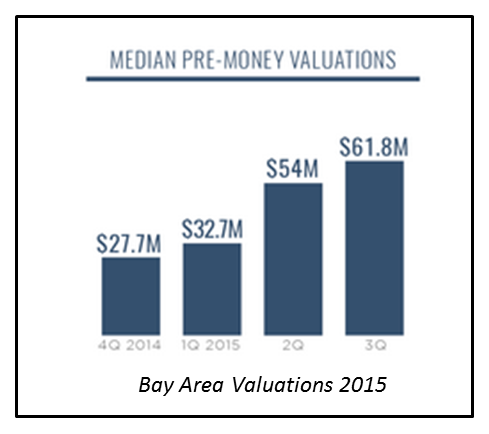 Second, Silicon Valley is not identical to the Tech sector. Although news coverage often glosses over this fact, innovation occurs in many places across the country. I will argue below that while Silicon Valley is indeed unique in many ways, generalizations based on that unique set of circumstances can often be wrong. In the current situation, the doom and gloom based on over-priced investments there is less relevant in other parts of the country. And so, the four cities. Dallas – Texas has several innovation centers including both Dallas and Austin. There is a diverse industry base, with concentrations in energy, health care/life sciences and tech, significant university presence, and a good concentration of wealth. Tech Wildcatters has successfully provided leadership to the region’s startup community with special programs in both health care and tech, and most recently going to a year-round program from the more typical discrete sessions. Dallas is a vibrant startup location, although it is unclear what effect the collapse of oil prices may have on access to capital in the region. Chicago – political issues aside, Chicago has the benefit of a high concentration of Fortune 500 Corporate Headquarters, a robust investment sector and strong University presence. TechNexus has done a masterful job first in priming the innovation ecosystem development 7 or 8 years ago, and now tapping into the innovation needs of Corporate strategic partners who are looking to early stage companies as a source of new products and ideas. If the city can recover from its social strife it is certainly positioned to continue as a significant center of tech innovation. San Francisco – San Francisco/Silicon Valley is the undisputed investment capital of the world for tech. According to Pitchbook in the third quarter of 2015 more than 27% of all the venture capital invested globally came out of Silicon Valley. 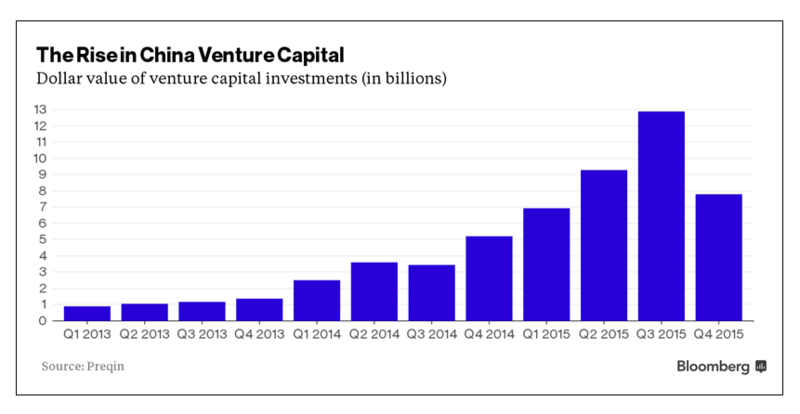 China has risen rapidly as both a source and target of VC investment, although the collapse of the economy in China seems certain to be a major setback in this area, as the graph seems to indicate starting in Q4 of 2015. New York ranks third on this list, providing just north of 8% of the globally invested capital. Yet with all that money floating around it appears that some Silicon Valley investors may have had more dollars than sense. If you look at the number of deals and the dollar amounts as compiled by Pitchbook, the dollars invested continued to rise in 2015 even while the number of deals plummet ed, leading to a rapid rise in median valuations. 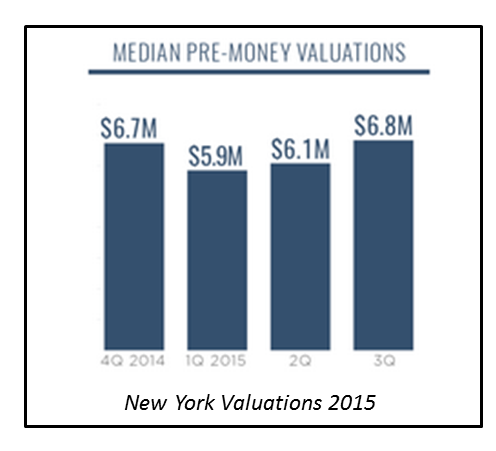 By comparison, valuations in New York during this same time were only 10% of the San Francisco valuations, an enormous disparity. There are some possible alternative explanations for this disparity (bigger opportunities, move towards later stage investments, etc), but both the anecdotal evidence at the time (“too much money chasing too few deals” was a sentiment we heard more than once) and the subsequent down rounds of investment even for some of the high flyers indicates over-valuation on the part of investors was at least one primary cause of the disparity. A second point. Why on earth would you want to locate and operate a company in the outrageously expensive environs of San Francisco where none of your employees can afford to live? Or Palo Alto, where Palantir is driving out start-ups by snapping up office space at high rents. Well there are certainly some reasons: if you want to hang with the cool kids, California is the place you ought to be. If you need to raise a billion dollars or so, where else would you go? And certainly if you want frothy valuations during the good times, the target destination is clear. Washington DC – The region centered around Washington DC is generally considered to include Maryland, Virginia (or at least Northern Virginia), and DC itself. The Federal Government is a large presence, along with some of the specialty areas such as cybersecurity and data analytics it has helped develop. Health care/life sciences is also a major player in the area, and there are multiple world-class universities that support the ecosystem. The region generally ranks in the Top 10 innovation areas of the country, and the area’s capital investments are growing, actually increasing in the 4th quarter of 2015 even while investments were declining nationally. One reason for this increase is the growth in cybersecurity, with the potential for more than a billion dollars in cybersecurity investments in the region in 2016. The two biggest areas were health care/bio and software (including cyber), and there is an organized, active ecosystem working to promote the growth of these and other industry sectors. The age of easy money from building the next mobile app may be behind us, but the advent of autonomous vehicles, personalized medicine, data-driven everything and more will ensure that the tech sector will continue to drive the next wave of innovation and economic growth for decades to come. But it is increasingly likely that the actual innovations will be found in places like Dallas, Chicago and the Washington region even if the investment capital still flows from New York and Silicon Valley.